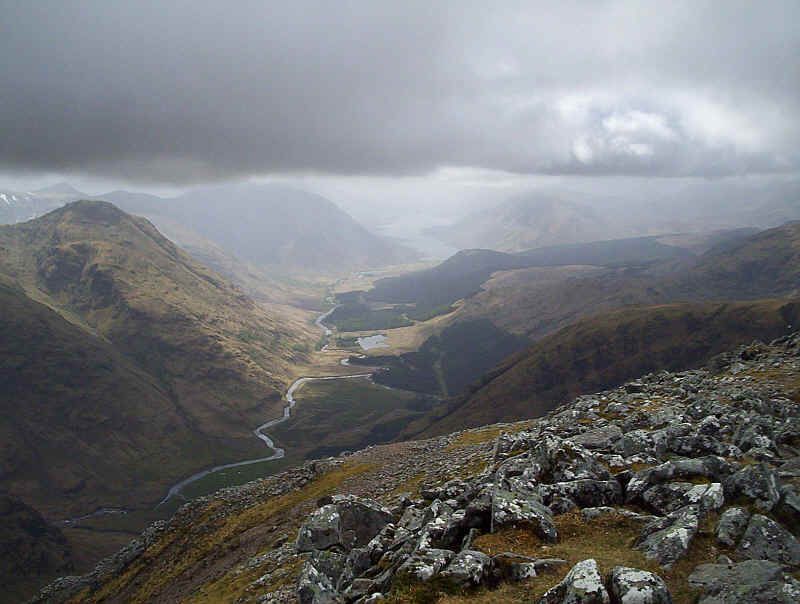 A return to Glen Coe in May 2009 at long last gave me better weather and the prospect of climbing the two Buachaille Etive hills. 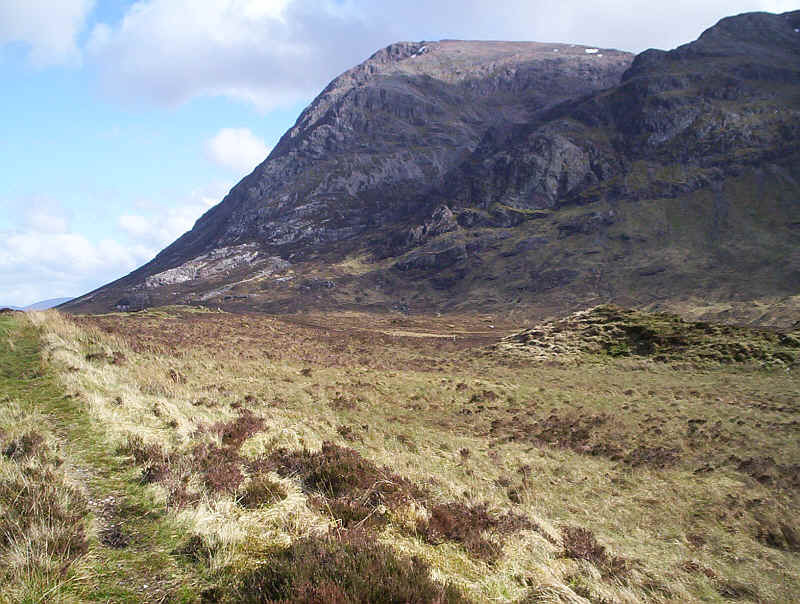 An extremely courteous and efficient Citylink driver deposited me at the car park just beyond Altnafeadh next to the signpost which states "Lairig Gartain to Glen Etive". 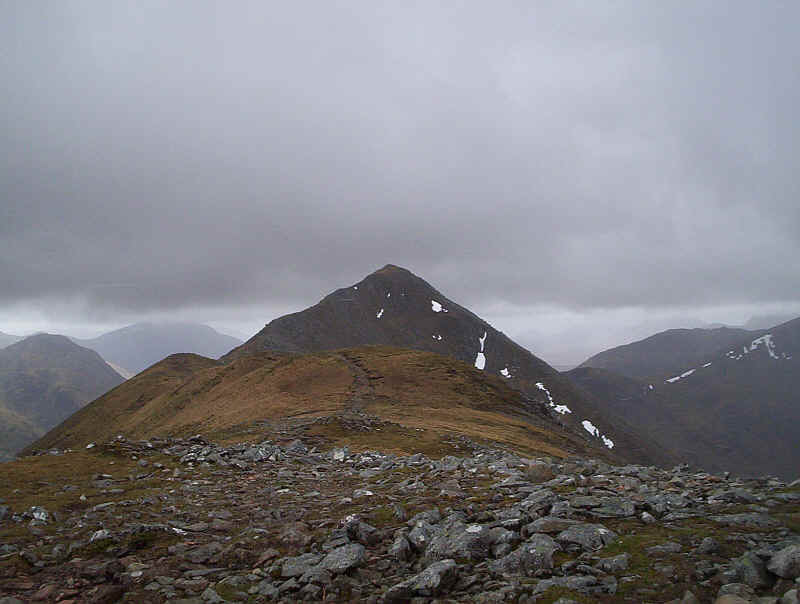 As can be seen there was some low cloud but the weather forecast promised a typical mixture of wind, sunshine, clouds, hail and snow. Initially the day was slightly spoilt by the realisation that my GPS, which had worked perfectly the evening before, refused to switch on. Clearly if the mist came down I was going to have to navigate the old-fashioned way! 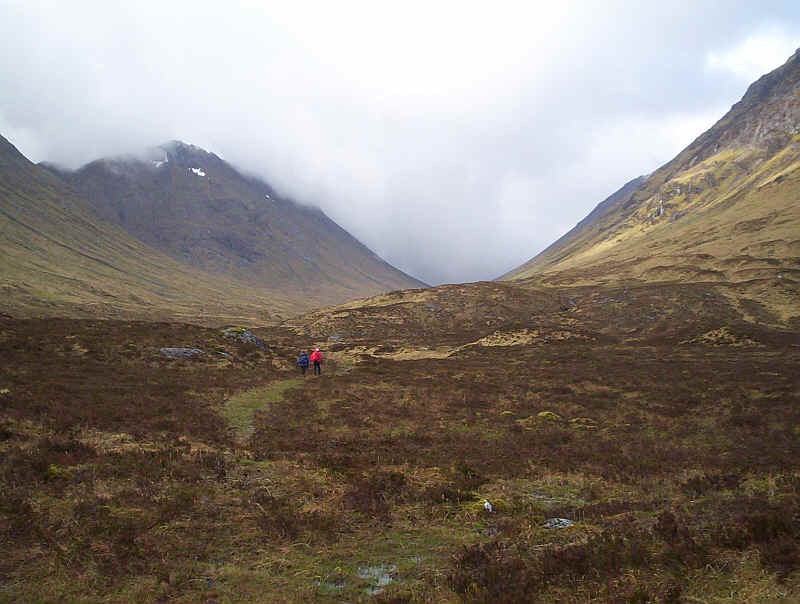 The route I'd chosen was to climb the hill from the Lairig Gartain side and return by the more traditional route down into the Lairig Eilde. 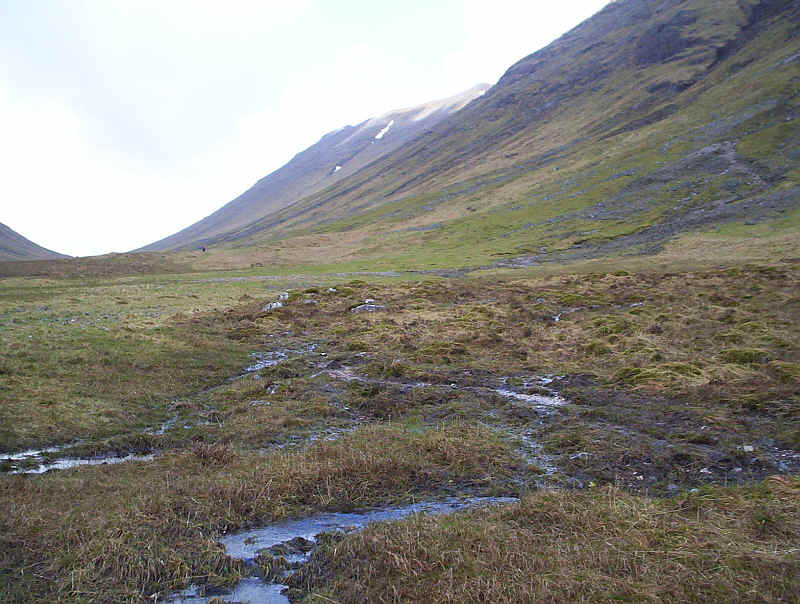 After negotiating the rather boggy area near the stream, which flows out of the Lochain na Fola into the River Coupall, much firmer ground was followed up the valley. 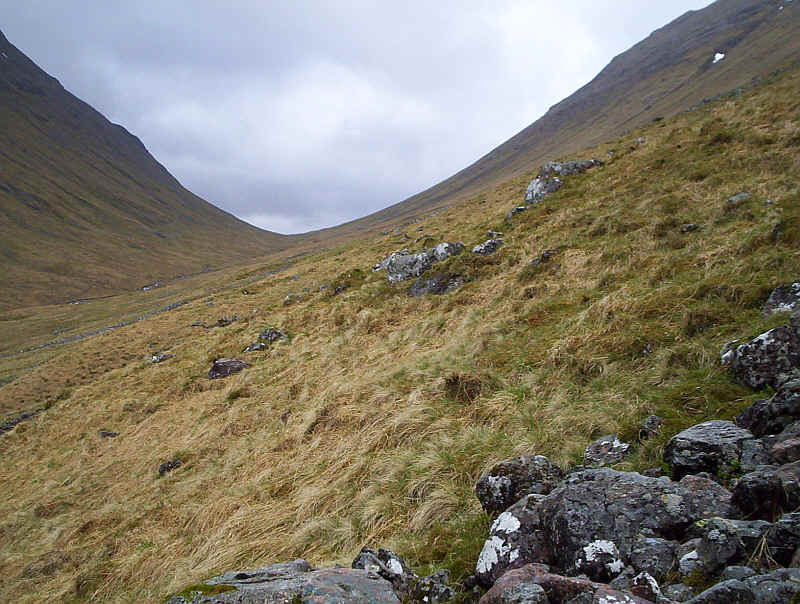 After about a kilometre I left the path and began a slow climb away from the valley floor, in order to gain height before tackling the steeper slopes to the right in the photo below. 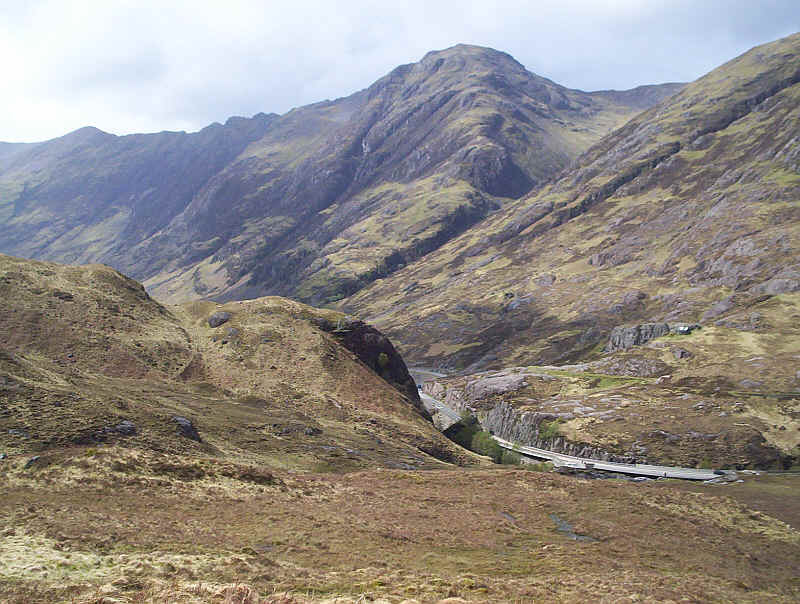 Below I'm looking back down the valley with the Corbett Beinn a' Chrulaiste to the right. 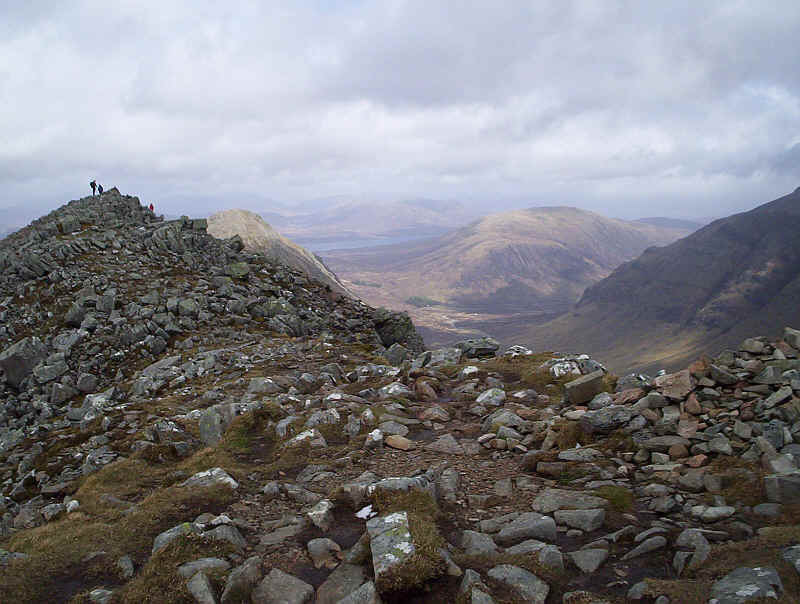 There are a lot of quite stony sections to negotiate on the climb but nothing of any real difficulty. 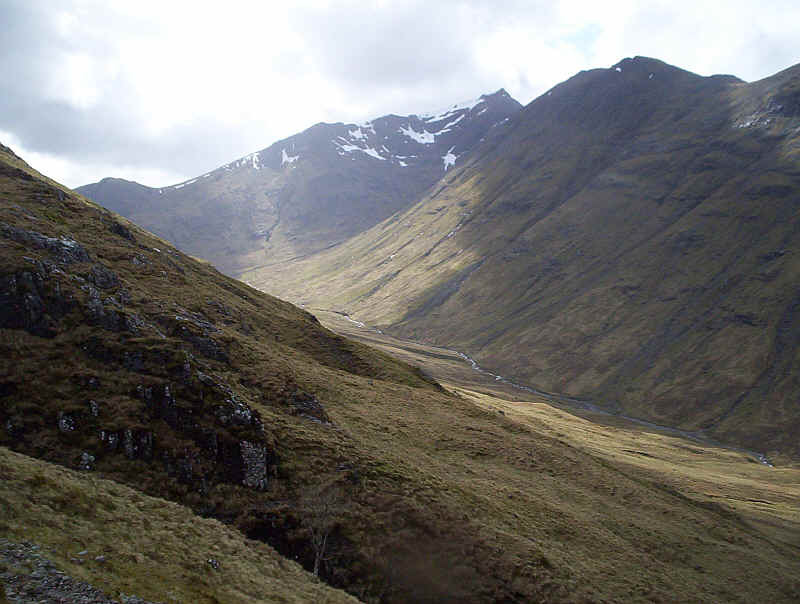 In the photo below the classic glaciated U shaped valley section is obvious. 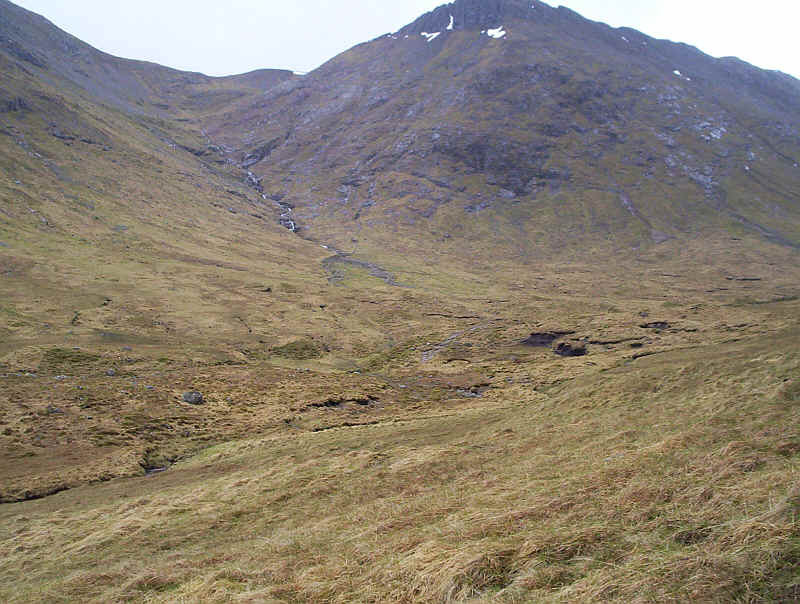 This is the watershed between the River Coupall, which flows north east towards the camera, and the Allt Gartain which flows south west into Glen Etive. 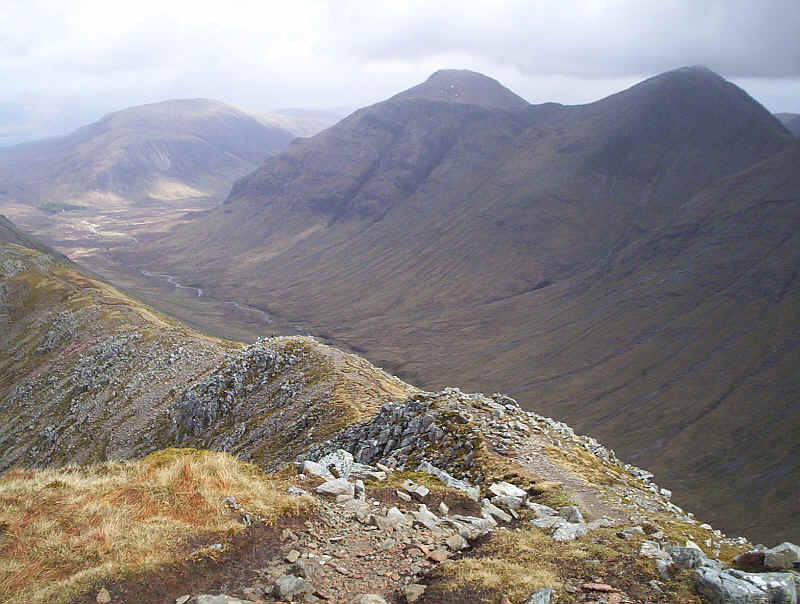 However, what is really interesting, is that the River Coupall flows right around Buachaille Etive Mor into the River Etive and then turns south west to join the Allt Gartain about 2kms beyond the watershed. It's flowed nearly 20km to reach that point just 2km away! 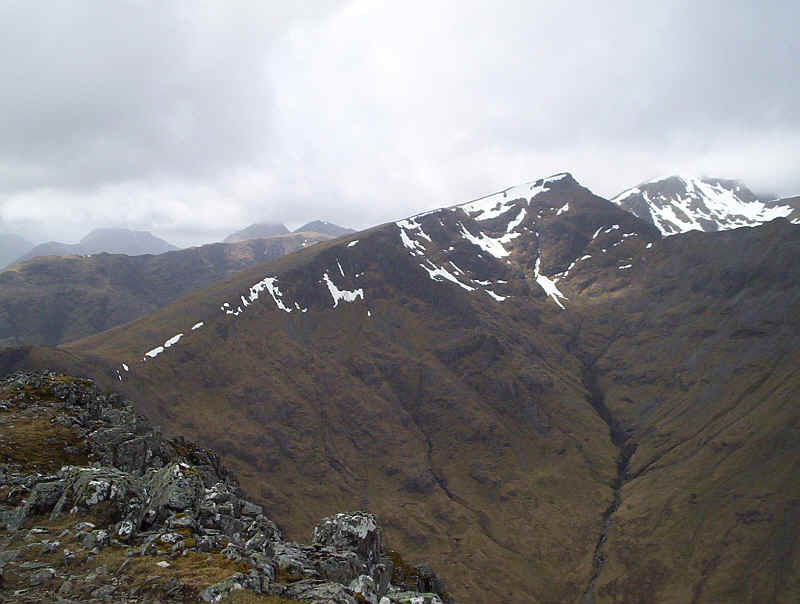 In this photograph I'm approaching the bealach between Stob Coire Raineach and Stob Dubh. A few minutes before a herd of deer could be seen on the skyline but disappeared when they were disturbed by two other walkers. 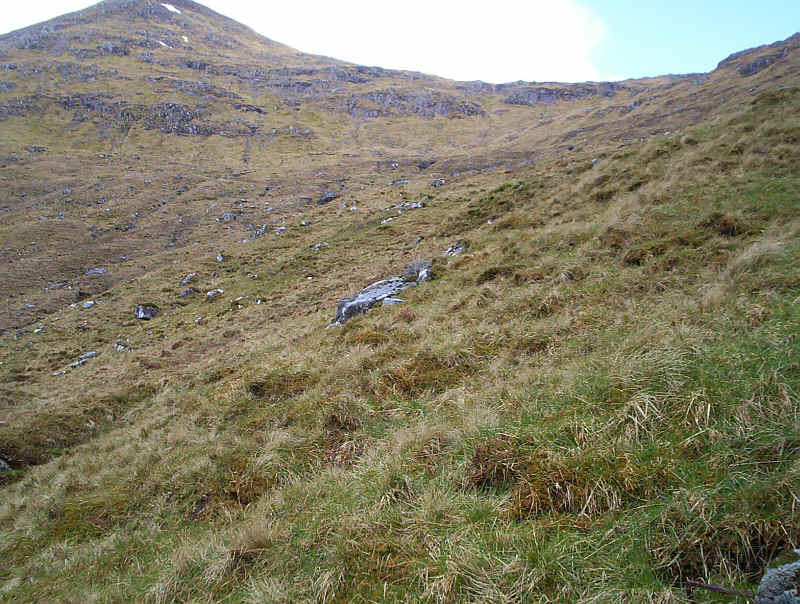 The steepness of the hillside is apparent in this photo but by traversing across it's an easy climb. 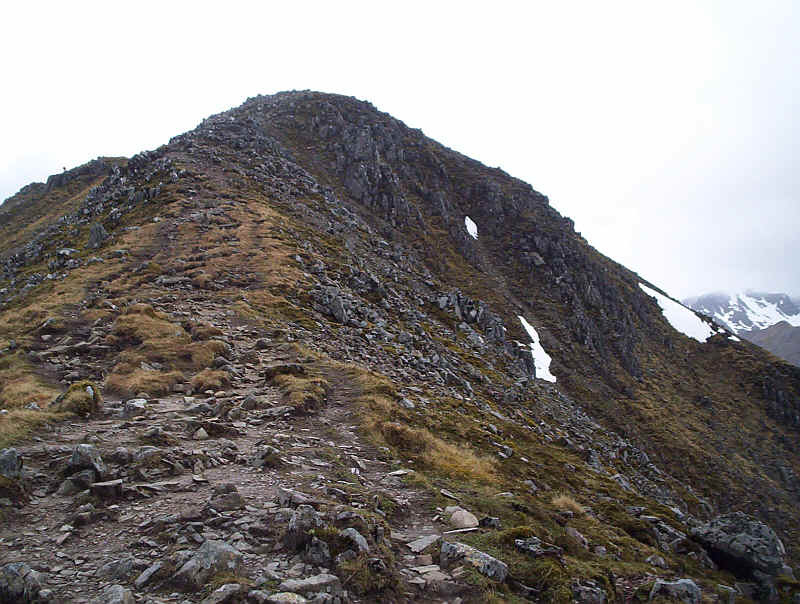 ......but I decide to do the lower peak of Stob Coire Raineach first. 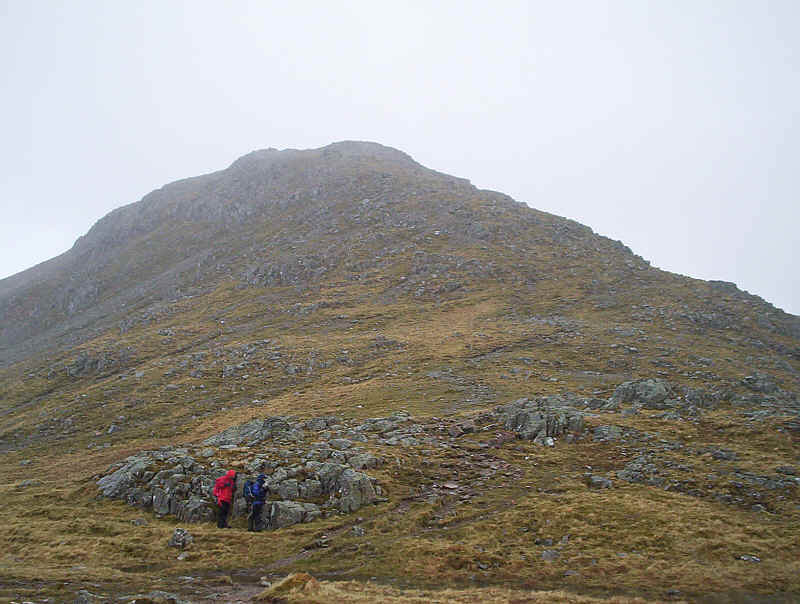 There are another couple of walkers already here and we walk to the summit together. 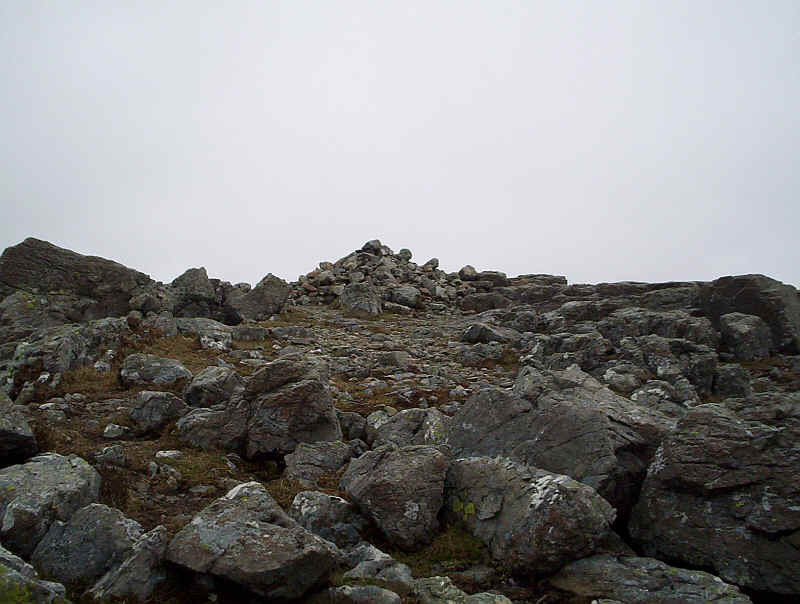 It's a steady and undemanding climb through the boulders to the top. 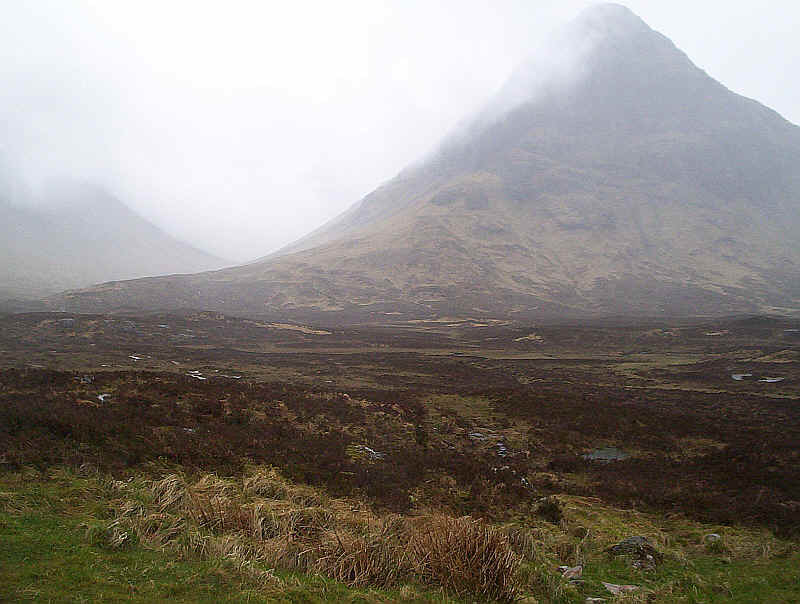 Sadly, the weather god has decided that there's not going to be much of a view and it starts to snow as I eat my lunch. I forget to keep my gloves on and before I know it my fingers stop working properly. The winter gloves are pulled out pretty smartish! 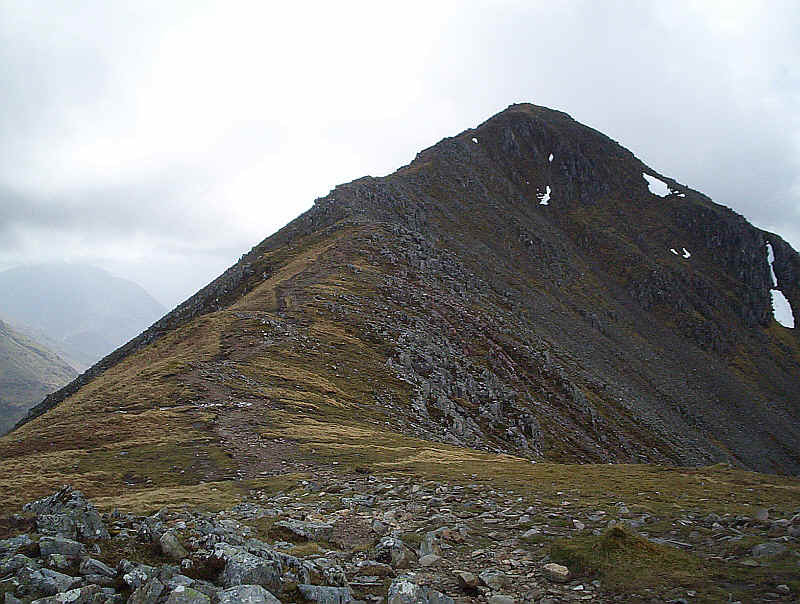 At least I now get a clear view of the summit of Stob Coire Raineach as I take the path up to the unnamed top at 902m. 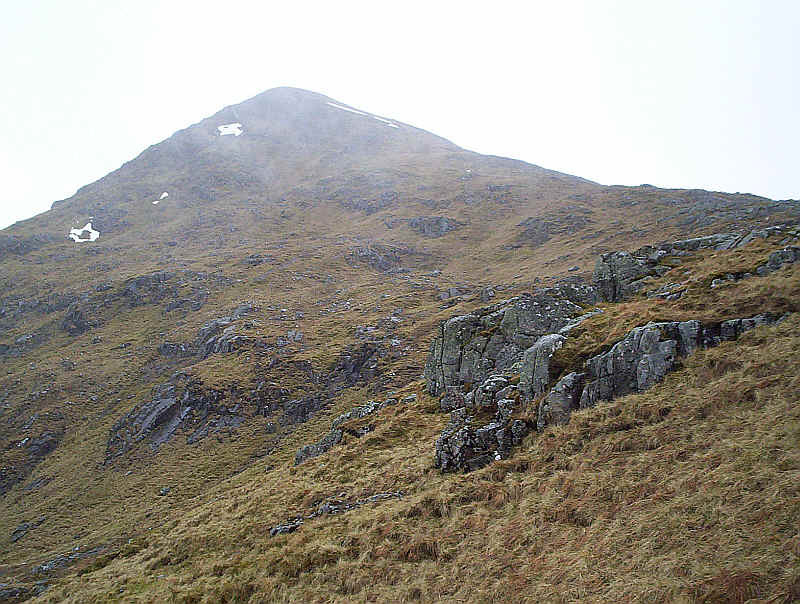 The ridge path is a delight and the odd snow shower just adds to the feeling. ..... but in reality it's nowhere near as bad as it looks from a distance. I wouldn't, however, like to be on it in a real gale. Clearly, there is some slight exposure in places but there's never a feeling of "where shall I put my foot next?" 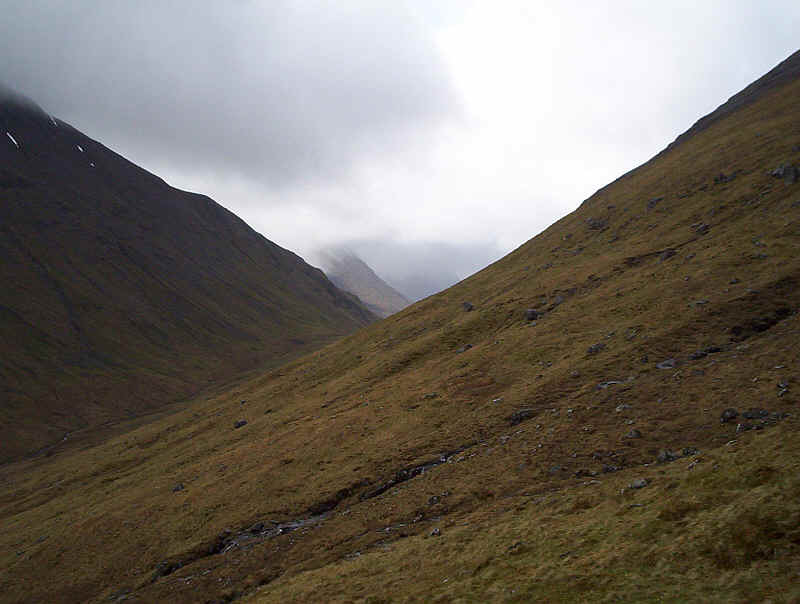 Here, the photo shows the route back along the ridge with the Blackwater reservoir in the distance. 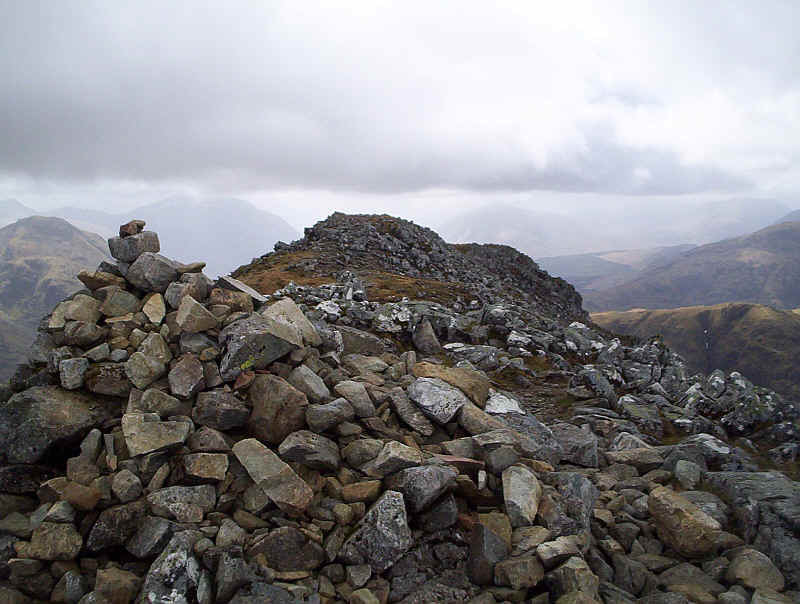 The summit of Stob Dubh. 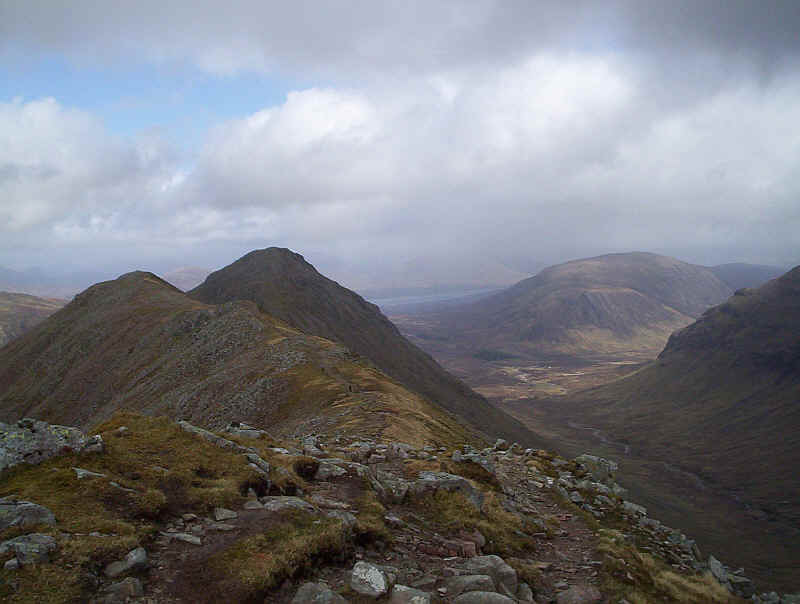 The view I'd been hoping for since I started planning this walk - Glen Etive with the loch in the distance. 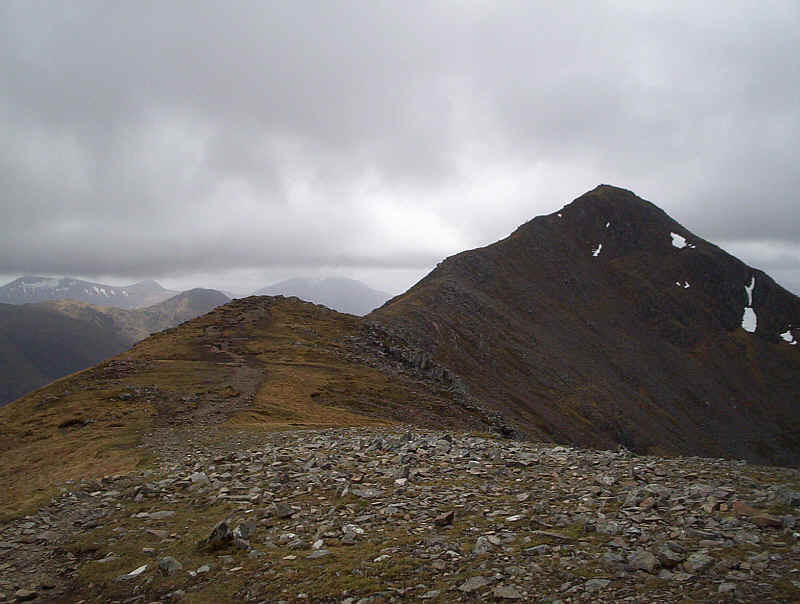 The summit of Stob Dubh looking from the south west. 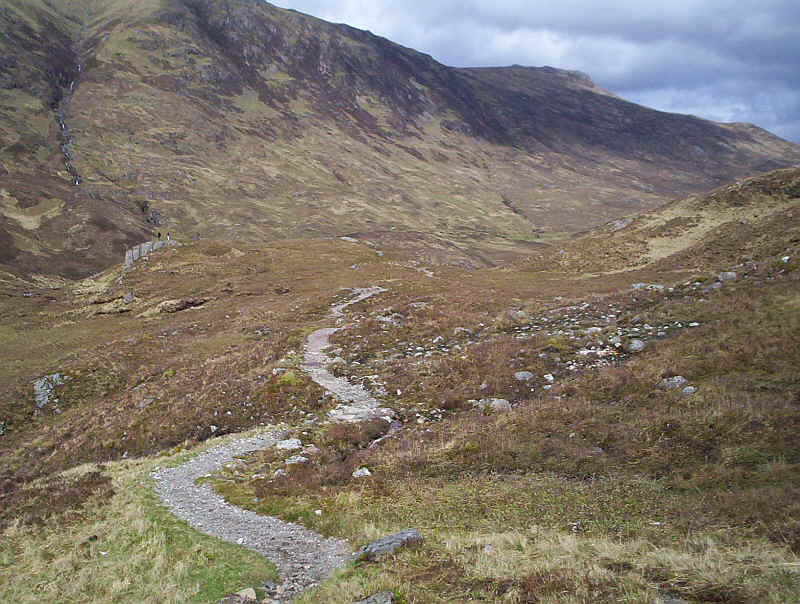 .....until it reaches the superbly engineered path which leads down all the way to the main road. 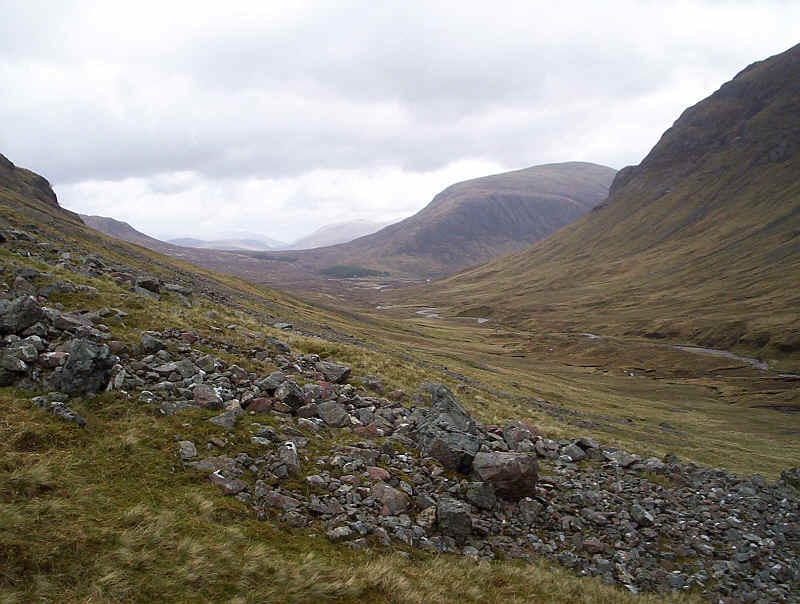 The photograph below is looking up the Lairig Eilde. 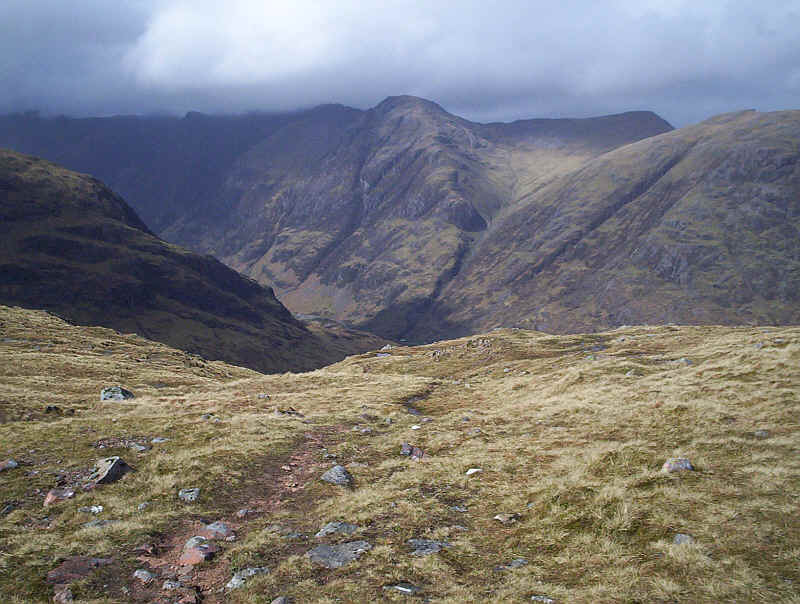 Here the path is almost down at the road, with the Aonach Eagach ridge and Meall Dearg towering above the glen. The road has been rebuilt on a concrete viaduct at this point. 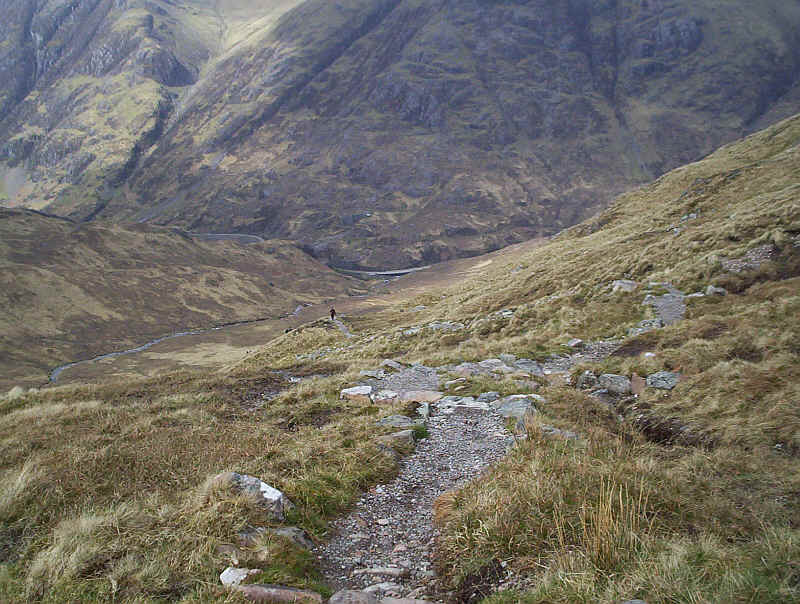 The final easy stretch of the path must tempt many unsuspecting walkers out of their cars. 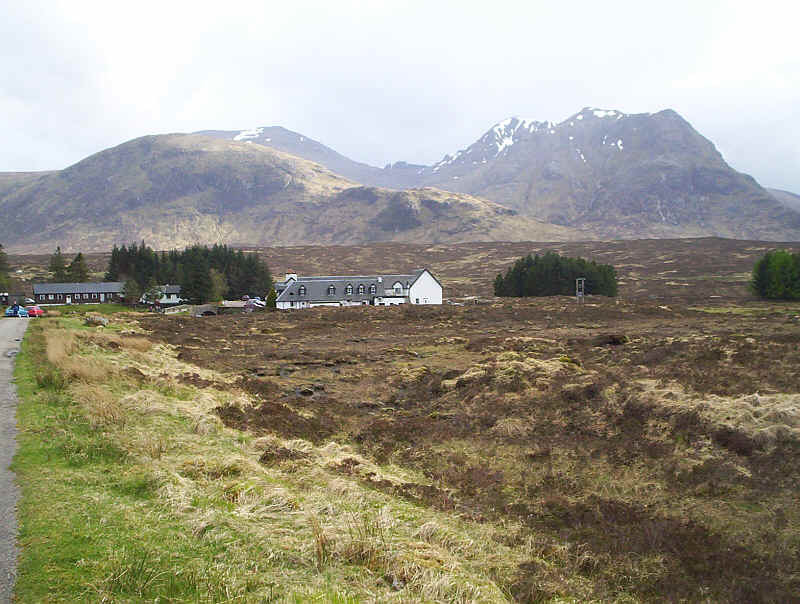 After crossing the main road it was time for the long walk back to the Kingshouse Hotel using the old military road and the West Highland Way path. 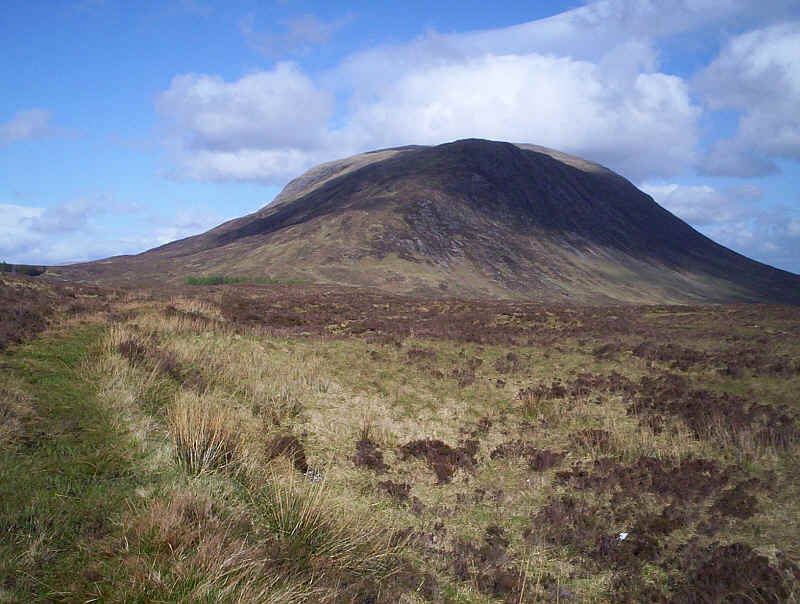 A beautiful spring evening and the next day's objective Buachaille Etive Mor reflects the sunshine, whilst its smaller neighbour Buachaille Etive Beag is in shade. 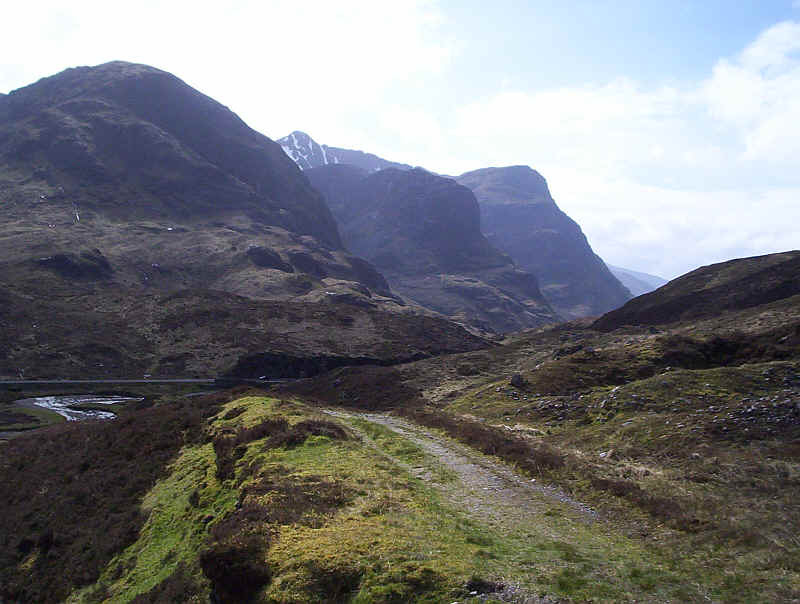 Apart from the continual din of traffic the walk back was pleasant and the views continued to improve. 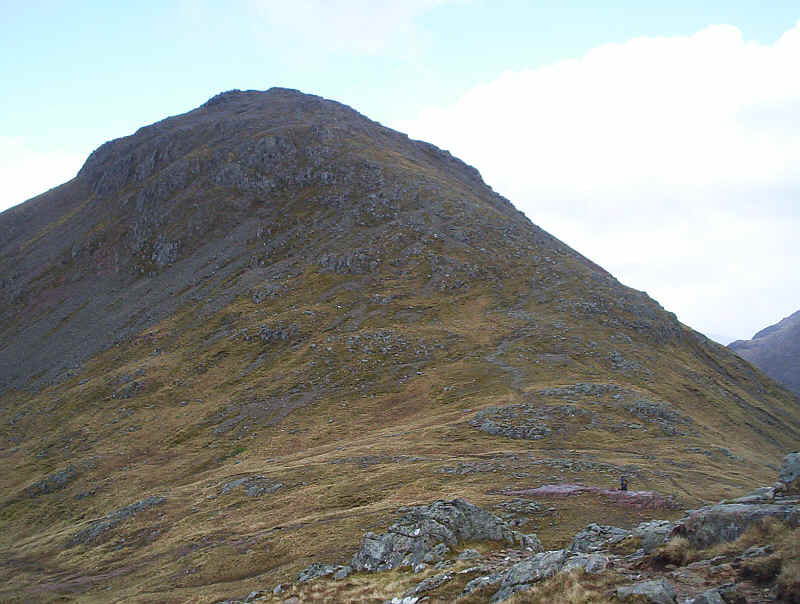 This is Beinn a' Chrulaiste with the woods at the bottom of the Devil's Staircase just visible. Bed for the night was at the Kingshouse Hotel. 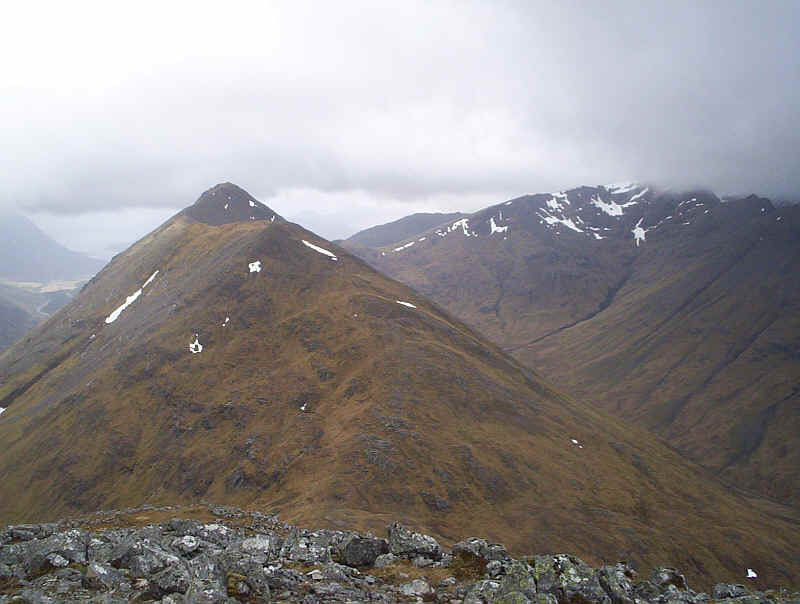 Beyond the last of the winter's snow can be seen on the ski slopes of Meall a' Bhuiridh with Creise on the right.